← DEAN’S LIST: IS IT TIME FOR A FOUR-MAN OFFICIATING CREW? KOKOMO, Ind. 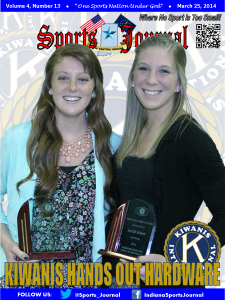 – The Kiwanis Club of Kokomo hosted its 31st Annual Girls Basketball Banquet at Kokomo High School. And to no surprise, the highlight of the evening was the display of the IHSAA Class 3A state championship trophy, courtesy of the Western Lady Panthers. “By gosh, I am glad (you displayed that) after we lugged that heavy thing in here,” joked Western head coach Chris Keisling when Kiwanis President Tom Birch presented it to the crowd. 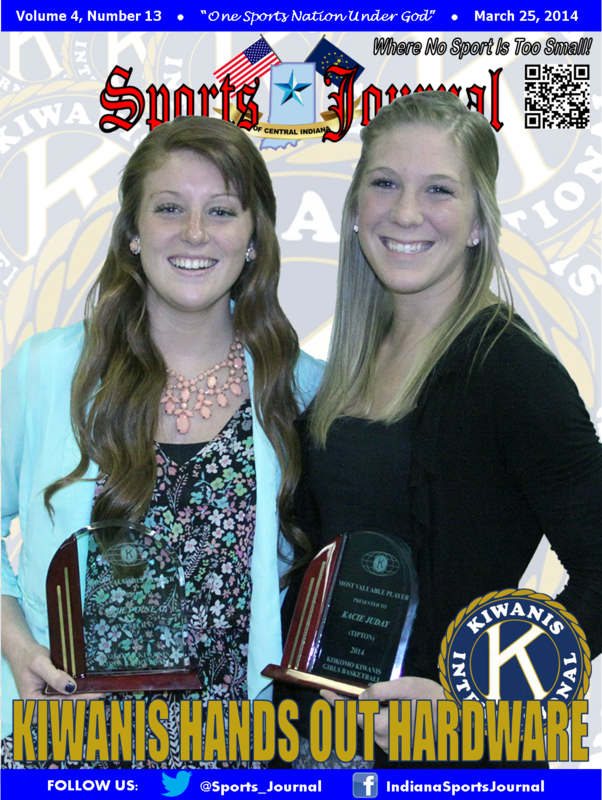 Billed as the largest high school girls basketball banquet in the Hoosier state, the Kiwanis Club of Kokomo established the banquet in 1984 to formally recognize the athletic and academic accomplishments of local area girls’ basketball teams. Since its origins of honoring Howard County squads, the banquet now honors the exploits of 10 area teams: Kokomo, Western, Northwestern, Taylor, Eastern, Tri-Central, Lewis Cass, Maconaquah, Carroll and Tipton. The Kiwanis clubs of Kokomo Golden K, Kokomo Metro, Burlington and Tipton also serve as host organizations. While Eastern stole the show last year, this year it was Tipton and Western who garnered the most honors – including Lady Blue Devil Kacie Juday who earned five individual honors. Juday took home trophies and plaques for being named the top assist leader (4.7 assists per game), steals leader (6.4 steals per game) and scoring leader (22.5 points per game). She was also the area’s only player to join the 1,000 Point Club, and the Kiwanis organization presented her a plaque for that accomplishment. She left the program as the all-time leading scorer in Lady Blue Devils history. Juday’s teammate Macie Lively earned the best free throw percentage trophy for hitting 78 percent of her freebies this year. Northwestern’s Brooke Treadway was named the area’s top rebounder at 12.0 rebounds per game. When it came time to name an area most valuable player, the honor was shared by Western’s Carley O’Neal and Juday. Both helped lead their team to outstanding seasons which resulted in Final Four berths. Juday joins her sister Brooklyn (co-MVP in 2012 with Western’s Nicole Rogers) as the only Tipton winners of the award, while O’Neal is the seventh from Western. The Lady Panthers seven MVP awards are third only to Kokomo (17) and Northwestern (eight). The Kiwanis Club also recognizes academic success, and the Western Lady Panthers earned the award for highest team grade point average, posting an impressive 3.72 GPA. They upended the two-time defending Team GPA champion’s from Tipton. The top award of the evening was a scholarship from the Kiwanis Club of Kokomo Foundation to the senior player with the highest grade point average. This year’s scholarship was awarded to Raven Black from Western. Black’s grade point average of 4.47 was the highest in the history of the Kiwanis banquet. For more information on the Kiwanis Club of Kokomo, visit www.kokomnoonkiwanis.com.